Change things up with a short trip to Litchfield National Park in Batchelor (about 1h 45 min away). Plan for a day of cool, family-friendly fun on the 24th (Thu) at Darwin Waterfront. Spend the 26th (Sat) wandering through the wild on a nature and wildlife tour. 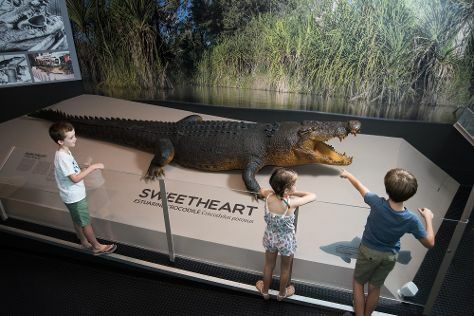 There's much more to do: look for all kinds of wild species at Crocosaurus Cove, admire the natural beauty at George Brown Darwin Botanic Gardens, get engrossed in the history at Darwin Aviation Museum, and make a splash at Wave Lagoon. For traveler tips, where to stay, reviews, and other tourist information, read Darwin trip itinerary builder . Kalgoorlie-Boulder to Darwin is an approximately 12.5-hour flight. You can also drive; or do a combination of train and bus. You'll lose 1 hour traveling from Kalgoorlie-Boulder to Darwin due to the time zone difference. Plan for somewhat warmer nights when traveling from Kalgoorlie-Boulder in January since evenings lows in Darwin dip to 29°C. Finish your sightseeing early on the 28th (Mon) so you can travel back home.